Our Laser Engraving system is able to mark stone, marble & granite with truly fine details. AOur laser engraving creates elegant patterns in the most popular Limestones, Marbles and Travertine for residential and commercial projects. From ornate stone rugs, borders and medallions to decs accents. Base borders, back splashes, to murals and many more exciting custom applications. Applying our laser engraving prior to installation in your lobby, hallways, boardrooms, kitchens, baths and more makes your project uniquely elegant and beautiful. Marble and Granite for your home, our engraved murals add an original elegant touch to your back splash, floor, bathroom, landscaping and more. For an enhanced custom look to your indoor murals. For your office interior, lobbies, boardrooms, and exterior, consider custom engraving floors, walls, and glass. Tables, exterior walls and signs that can be engraved with your custom image, logo, or design. Prior to our joint venture, please allow us to at a test and etch a small sample of material for etching compatibility. 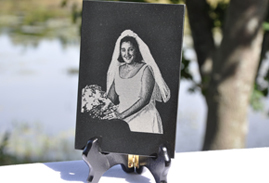 Custom Image Laser Engraving also carries a selection of tile including Black Marble and Absolute Granite invarious sizes including 12x12. Engraved granite is highly recommended for high traffic areas, exterior surfaces and where extreme durabilityis require.